Mya’s little black hat was quite popular and I received many requests for the hat to be released in other sizes! This free pattern includes size from preemie to adult large. 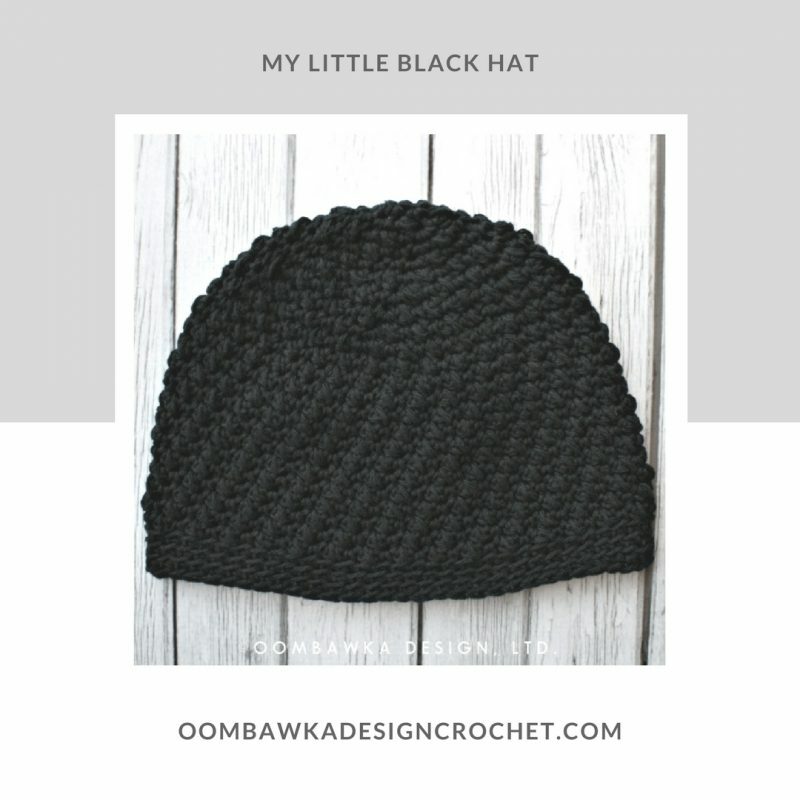 My Little Black Hat Pattern is crocheted with medium weight  cotton yarn and is an easy crochet pattern. 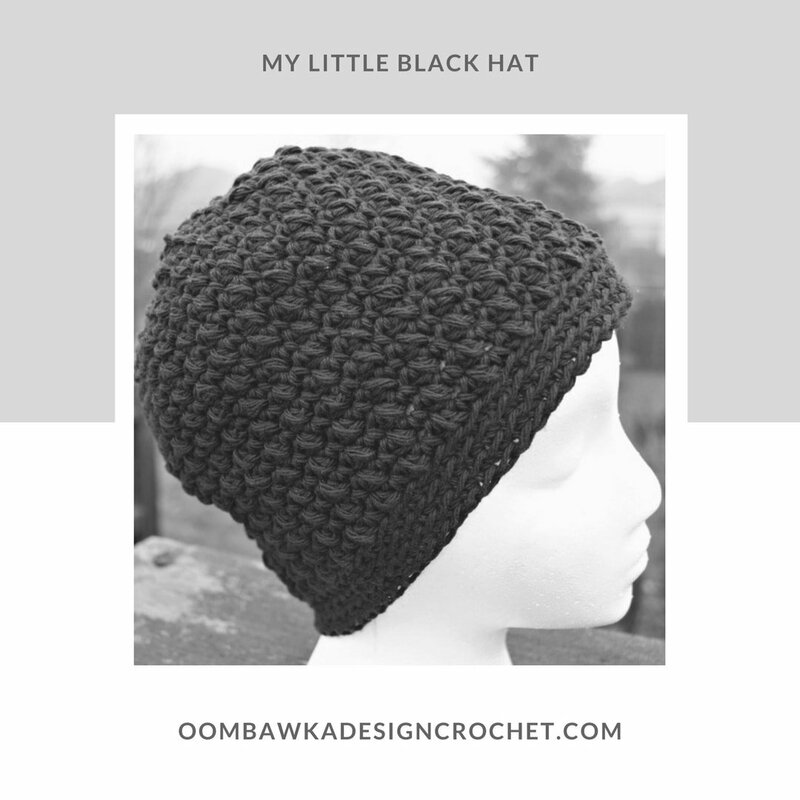 This is Mya’s Little Black Hat Pattern, resized for sizes preemie to Adult Large. Perfect for summertime and for chemo caps because it is designed to be crocheted with cotton yarn. Cluster: *yarn over the hook, insert hook into the specified stitch, yarn over and pull up a loop**. Rep from * to ** one more time. Yarn over and pull through all 5 loops on the hook to complete the cluster. 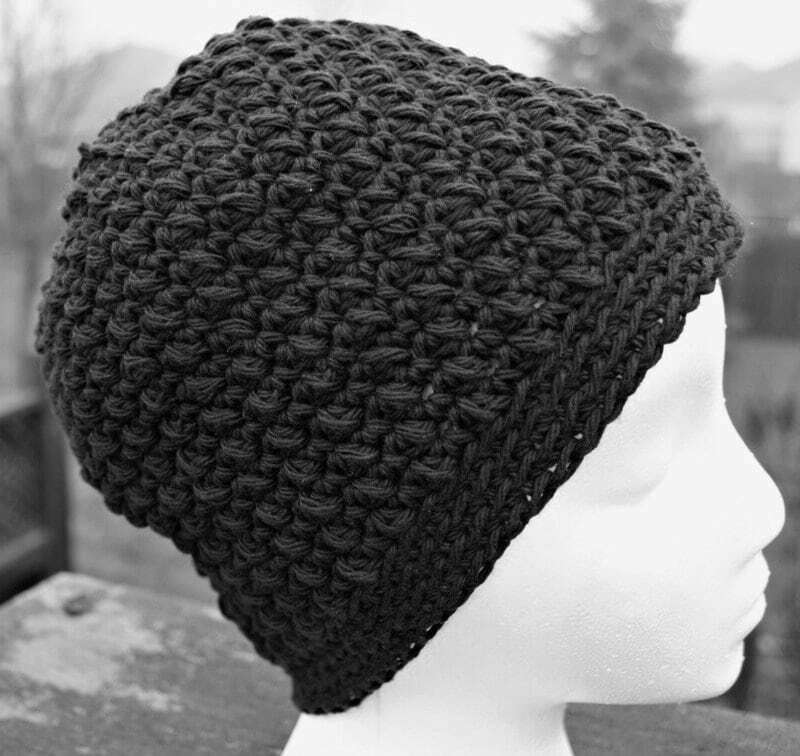 To Make a Mid-Ear Length Hat instead, stop after R10 and then work the 2 rounds of blsc to finish. To Make a Mid-Ear Length Hat instead, stop after R11 and then work the 2 rounds of blsc to finish. To Make a Mid-Ear Length Hat instead, stop after R13 and then work the 3 rounds of blsc to finish. To Make a Mid-Ear Length Hat instead, stop after R14 and then work the 3 rounds of blsc to finish. To Make a Mid-Ear Length Hat instead, stop after R15 and then work the 3 rounds of blsc to finish. To Make a Mid-Ear Length Hat instead, stop after R16 and then work the 3 rounds of blsc to finish. To Make a Mid-Ear Length Hat instead, stop after R17 and then work the 3 rounds of blsc to finish. To Make a Mid-Ear Length Hat instead, stop after R18 and then work the 3 rounds of blsc to finish. To Make a Mid-Ear Length Hat instead, stop after R19 and then work the 3 rounds of blsc to finish. To Make a Mid-Ear Length Hat instead, stop after R20 and then work the 3 rounds of blsc to finish. Can you please clarify round 8 of the newborn sized hat? Have you ever made a scarf to match the hat? I made the hat in Universal Yarn’s Classic Frenzy Urban Transit. I love the design for this yarn and would like to make a matching scarf. Any suggestions? I used black worsted and size 5 hook it looks great. I should have stopped at row 19 as advised above and then started brim. My daughter loves her hat. I’m making 2 more for myself and oldest daughter in different colors. The black is beautiful. I can see myself wearing this is other colors too. Thank you for your patterns. Love this pattern, thanks for sharing. If I use worsted weight yarn for this hat what size hook do I need to use? On your pattern for THE LITTLE BLACK HAT, is this worked in the round, or do you join to first stitch and chain one. Thank you! Thank you! I really love My Little Black Hat. It is so comfortable and the cotton makes it cool – not over warm to wear. Thanks so much. What a great look! Can youplease put jump links in at the top of the page for the various sizes? It would make the page much more usable! I plan on making a load of these for my local cancer Centre! Thank you for the pattern. I’ve just started crocheting again and need quick projects to get back into the stitch rhythm.